Considering the huge increase in education costs in recent decades, it would be almost impossible for many Catholic schools to exist today if they relied on tuition alone. Aside from the schools’ own fundraising efforts, several nonprofits provide tuition assistance and other grants to assist Catholic schools. Probably the best known and the largest are Business Leadership Organized for Catholic Schools (BLOCS), the Connelly Foundation and the Maguire Foundation. Another emerging Catholic group is the Foundation for Catholic Education, which was founded in Chester County in 2010 and started with grants totaling $179,000 in the 2011-12 school year. It projects to distribute $2,425,000 this school year, according to its annual report. The foundation was begun primarily by Msgr. Joseph Marino, who was then regional vicar for Chester County, and local businessman Gerry Parsons, who is still very active with the group. While it originated in Chester County it is now active across the Archdiocese of Philadelphia. A unique feature of the Foundation for Catholic Education is its focus on Catholic elementary education in the parish schools and regional elementary schools of the archdiocese rather than secondary schools and the independent elementary schools. As it has often been suggested, there would be no archdiocesan high schools if all of the feeder elementary schools closed. When the foundation began there was a need to develop strategies for school advisory councils that were established in the five counties of the archdiocese (two in Philadelphia), Parsons explained. The idea was the Foundation for Catholic Education could help fund initiatives that were developed. The foundation receives funding through galas conducted annually in six regional areas and from direct donations from benefactors. More recently it has been able to grow by taking advantage of Pennsylvania’s Educational Improvement Tax Program and Opportunity Scholarship Tax Credit Program (EITC/OSTC) through which 75 percent, and up to 90 percent, of the donation to non-public schools can be deducted from taxes owed to the state. At this time the state budget allocates $160 million statewide to the EITC program and an additional $50 million to the OSTC program, which is limited to scholarships for children who live in an area where the local public school is considered failing. The donations are made directly to a state-approved Opportunity Scholarship Organization, such as that of the Foundation for Catholic Education, which distributes it to a school or schools. The donors can then claim up to 90 percent on a two-year commitment against their state taxes. Until very recently this program was open only to corporations and businesses, but it is now also available to individual donors through membership in a Special Purpose Entity (SPE) including the one formed by the Foundation for Catholic Education. Although a business or individual cannot direct the scholarship to assist a particular student, they can, if they wish, direct it to a particular school that receives funding from the foundation. The Foundation for Catholic Education works closely with BLOCS but the major difference, Parsons explained, is that BLOCS, as its name suggests, works with the business community while the foundation mostly works mostly with individual donors. In addition to working through the EITC/OSTC scholarship programs, the Foundation for Catholic Education also does other grants. For example, as Parsons explained, Father Joseph Maloney at St. Aloysius Parish in Pottstown was badly in need of a new school. His students were scattered in four buildings that were not joined together. 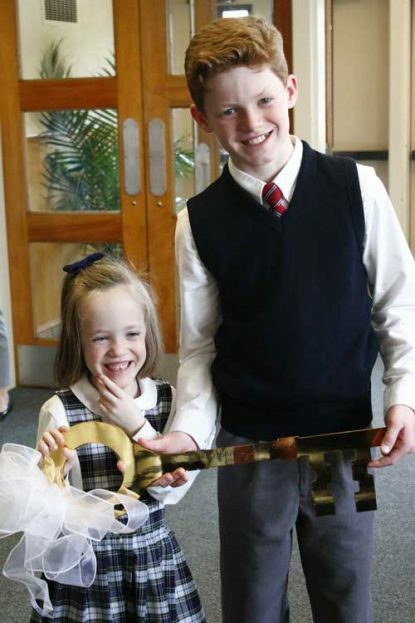 Elise (kindergarten) and Luke Bell (sixth grade) hold the symbolic key to the new building for St Aloysius School in Pottstown. Nearby was the former St. Pius X High School which closed when Pope John Paul II High School opened and remained vacant for seven years. The campus was purchased by the Foundation for Catholic Education, refitted and leased for a dollar a year to St. Aloysius Parish. Now little kids are sitting in the same classrooms where their parents attended high school. Father Thomas Higgins, the pastor Holy Innocents Parish and active with the Philadelphia North County Advisory Council, has nothing but good things to say about the work done by the foundation, both through practical advice to the council members and material assistance to the parish schools. That includes Holy Innocents and especially schools that may be having difficult times. While much of the funds raised are donor directed to a specific school, funds are also given to such schools or projects that the local advisory council recommends. Through the Foundation for Catholic Education and the EITC program and other sources, “we will have about $80,000 in scholarships available for the 2019-20 school year,” estimated Steve Litz, the business manager at St. Andrew Parish, Drexel Hill. In his view the inclusion of the individual donors through the SPEs is a real game changer. This really helps with the retention of families with multiple children and in attracting new families to the 440-student St. Andrew school. The Foundation for Catholic Education accepts donations as low as $1,000 through their SPE program, which is well within the range of the state taxes paid by many Pennsylvania taxpayers. They receive 90 percent of that back as a tax rebate and a net cost to the donor of $100, according to Judi Neeld, the director of development at the foundation. The foundation has a wide range of donors through the program, she said, with donations to the EITC and OSTC programs ranging from the $1,000 minimum to hundreds of thousands, and an average donation of $4,000. “We make it possible for everyone to participate,” Neeld said. For more information on the Foundation for Catholic Education call 610-793-8503 or email jneeld@foundationforcatholiceducation.org .